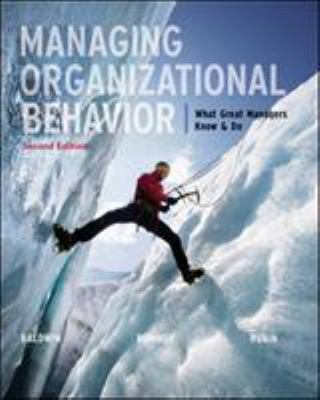 Managing Organizational Behavior by "Baldwin/Bommer/Rubin" distinguishes itself from other OB texts by taking a carefully-balanced approach to OB. It covers all traditional OB topics but in a decision-oriented, not just descriptive, way. It embraces the best OB models and evidence but engages students in how to use those models to improve their skill-sets and more successfully navigate organizational life. It is expressly designed to reconcile student demands for relevance and application with instructor interests in rigor, evidence and appropriate coverage of the discipline. Its student-centric materials provide students with relevant cutting-edge research and applications through extensive case studies, "Manage What?" situations, and practical Tool Kits that bring OB and career success to real life.